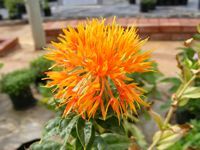 Carthamus tinctorius (Safflower) was introduced into Europe from Egypt in 1551. The name Carthamus is derived from the Arabic 'qurtom' or the Hebrew 'qarthami' - 'to paint'. The flowers contain a pigment 'carthamin' that is yellow in water and red in alcohol. Saffron is a tall annual up to 30-60cm tall, with an erect stem and spine-toothed leaves from 3-9cm long. In summer it bears thistle-like flower heads to 4cm across, with deep yellow florets surrounded by leafy, spine-edged bracts, followed by oblong white seeds. Seeds are sown in spring, plant 30-50cm apart - it need light, well-drained soil in sun and will do best in a climate with a long dry season and a limited rainy season. Safflower seed oil is flavorless and colorless and has a high smoke point that compares favorably with other vegetable oils. It is nutritionally similar to sunflower oil and is used in cooking and in salad dressing. 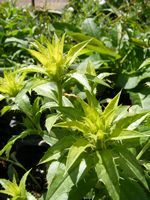 Safflower seed oil is also used in the production of margarine. Safflower flowers can be used in cooking as a substitute for saffron. The seeds are edible and can be used to coagulate milk. The flowers are a source of red and yellow dyes used to color dairy products, liqueurs and confectionery. The flowers, seeds and oil. 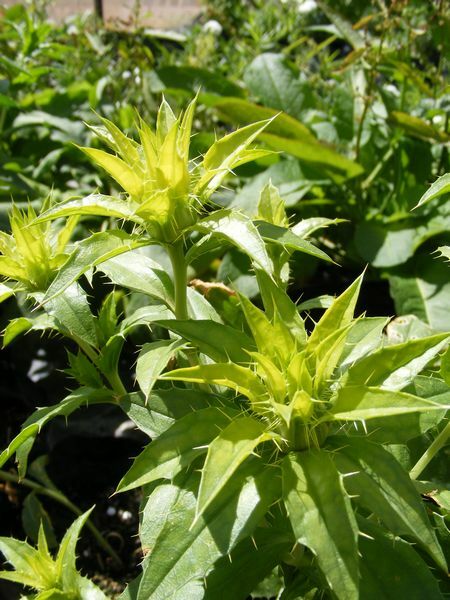 Safflower seed oil is used as part of cholesterol-reducing diets and it is an excellent source of vitamin B6. The flowers are used internally for coronary artery disease, menstrual and menopausal problems, jaundice and measles. 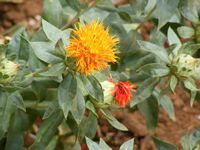 In dietary use, high-linoleic safflower oil has shown to increase adiponectin, a protein that helps regulate blood glucose levels and fatty-acid breakdown. 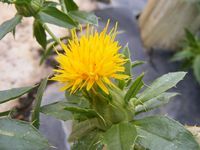 During a 16-week, double-blind controlled study conducted at Ohio State University, researchers compared high-linoleic safflower oil (SAF) with conjugated linoleic acid (CLA). They studied post-menopausal women who had high blood sugar and wanted to lose weight. These participants showed an average reduction of 6.3 percent belly fat and an average of 20.3 percent increase in the important belly fat hormone, adiponectin. The flowers are used externally for bruising, sprains, skin inflammations, wounds, painful and paralyzed joints. Safflower seed can be used as an alternative to sunflower seed in birdfeeders - as squirrels do not like the taste of it. Safflower oil is a medium for oil colors. Dried safflower flowers are used as a natural textile dye.